Here it is, mid-September in Oregon, and I have a dandy crop of green tomatoes. At this point, they’re not likely to ripen much more. What to do? Well, I grew up in the South, and we know exactly what to do with green tomatoes. “Fried Green Tomatoes” is not just the name of a terrific play and movie, it’s also a favorite Southern dish. It’s an appetizer, a first course, the basis for a sandwich or for a brunch entrée, or a “just because” snack. 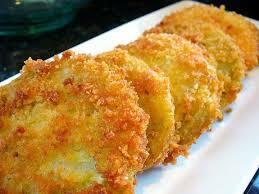 Use green tomatoes because they hold their shape and texture when fried. They are best eaten hot, or at least warm. Everything else is negotiable. Like most “country” dishes, there are almost infinite variations. I’ll give you my version, but you should feel free to experiment. 1. Start with 3 or 4 or 5 green tomatoes, however many you have on the day you’re doing this. I like them on the small side, because at that size they’re easier to manage as a snack item, but of course you’ll use what you have. Slice them about 1/3 inch thick, or ¼ inch, or ½ inch; it’s not critical. 2. In a large skillet (cast iron, if you have one), add vegetable oil for frying. Start with about ½ cup, you may need to add more as you proceed. Heat to low while you do the next steps. In bowl 1, 1 cup of flour mixed with salt and pepper, about ½ teaspoon each. I sometimes add a pinch of red pepper flakes. In bowl 3, your crumb mixture. The classic is ½ cup bread crumbs and ½ cup cornmeal (white cornmeal, if you’re Southern). I made one change: I use panko crumbs only; their extra crispness is just right for this treat. And next time, I think I’ll fold in some grated parmesan too. Yeah I know it isn’t traditional; sue me.